Yvonne Roberts has an exhibition coming up soon at St Paul’s Centre in Worthing. ‘Protect and Sustain’ will run from 4th August to the 31st August so there’s plenty of time to get along there to see Yvonne’s artwork. It’s a great place to grab a coffee too – or lunch if you have the time. Good luck with the show Yvonne! Society member Sehila Craft is one of 50 artists showing her artwork at the Towner in Eastbourne as part of the Sussex Open Exhibition. The show runs until 1st October and entry is free. Sehila’s painting, ‘Bonnard’s jug’ is in the room to your right as you enter the gallery. Well done Sehila for being selected for this prestigious show. Society member Ray Skingley will be exhibiting his artwork alongside other members of the Arun Art Society in their 2017 exhibition. The show takes place at Ferring Village Hall from Monday 31st July until Saturday 5th August, opening from 10am-5.30pm. On Thursday 3rd August the exhibition will open from 10am-8pm. Admission is free. During the exhibition there will be a raffle in aid of St Barnabas Hospice – the prize is a painting by a well-known artist – who that artist is I’m afraid the poster doesn’t reveal! Ray invites you along to find out, and to see his latest artwork! I hope we have all now recovered from the 2017 Art Trail. My house is almost back to normal! Congratulations to all those Society members who took part this year and who sold work to visitors from near and far. Thanks to those who promoted the Society and who showed the local community the high standard of artwork created by Society members. I’ve added a new page under ‘Exhibitions’ for your photos of the trail and hope that you will send your images to me to be included on the page. 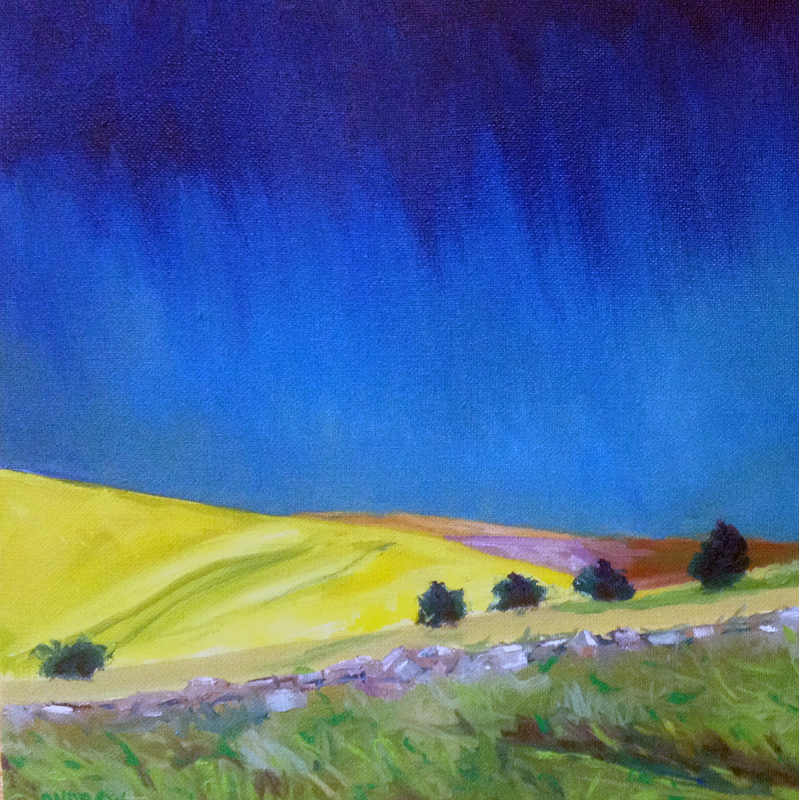 Here is a landscape by our chairman Andrew, from Venue 65. All this creativity bodes well for our Society exhibition this year. I’m really looking forward to the show at Colonnade House Gallery in December. I know it’s going to be a knockout exhibition during the run up to Christmas and with a display of affordable paintings, sculpture, textiles and more, as well as cards and Christmas decorations, in a gallery right in the heart of Worthing, Society members have a really good chance of making some sales. So start creating! 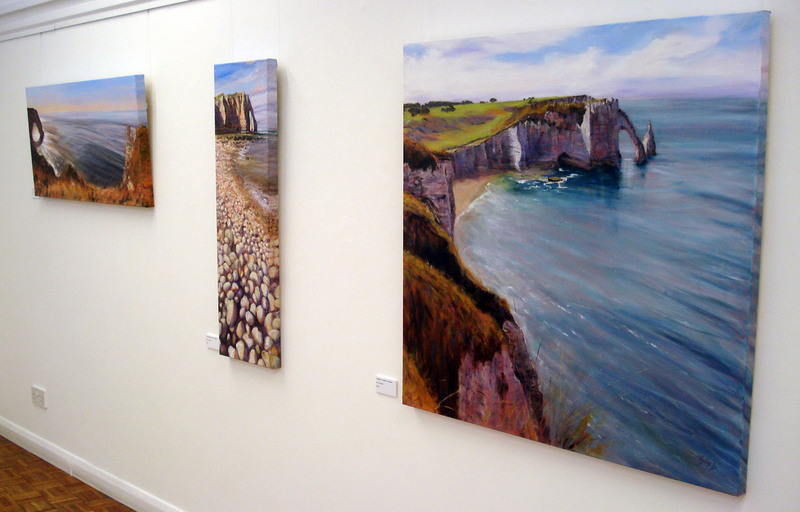 I was over in Chichester a week ago and happened to call in to the Oxmarket Art Gallery. 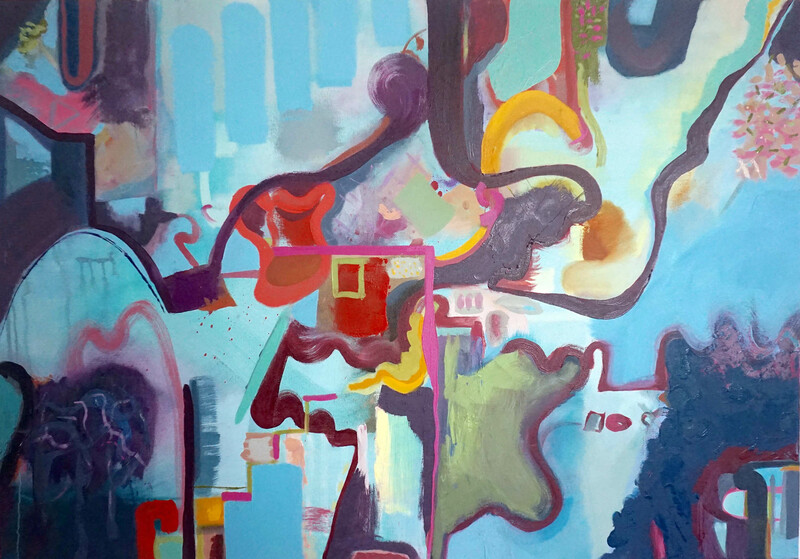 I discovered a beautiful exhibition of artwork by Society member Aylin Dengizer-Sharp. 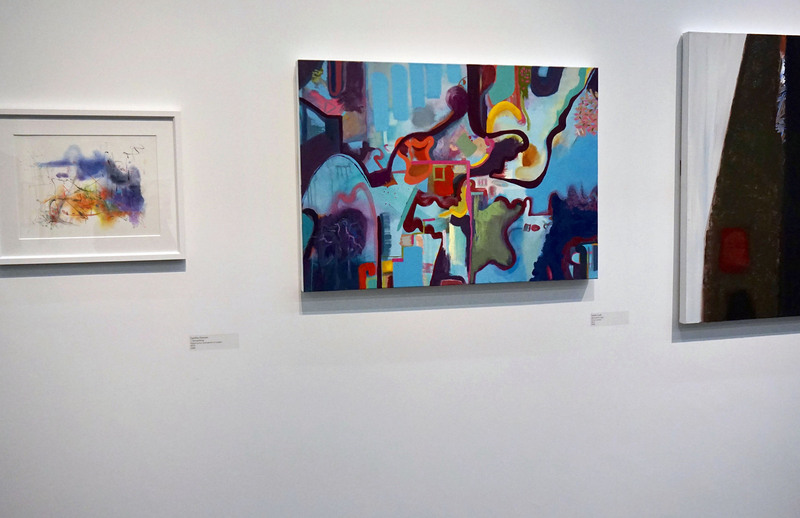 If you didn’t manage to catch Aylin’s show you can see some images of the work here by going to the Exhibitions pages. I did ask for permission to take the photos before snapping away and I hope the images have done your work justice Aylin and you don’t mind me posting them on this site. I love your paintings – gorgeous colours and fabulous brush marks. I hope you made some sales! On Saturday I once again visited the Open Art Exhibition at Worthing Museum. It was so crowded on the preview evening back in November that I didn’t really have a chance to look at all the work in detail. With Christmas out of the way and the New Year well and truly begun I had the time to revisit. The Society are very well represented at the show with seventeen pieces of artwork by Society members. I asked permission to photograph the work in situ and have added a new gallery page to this site. 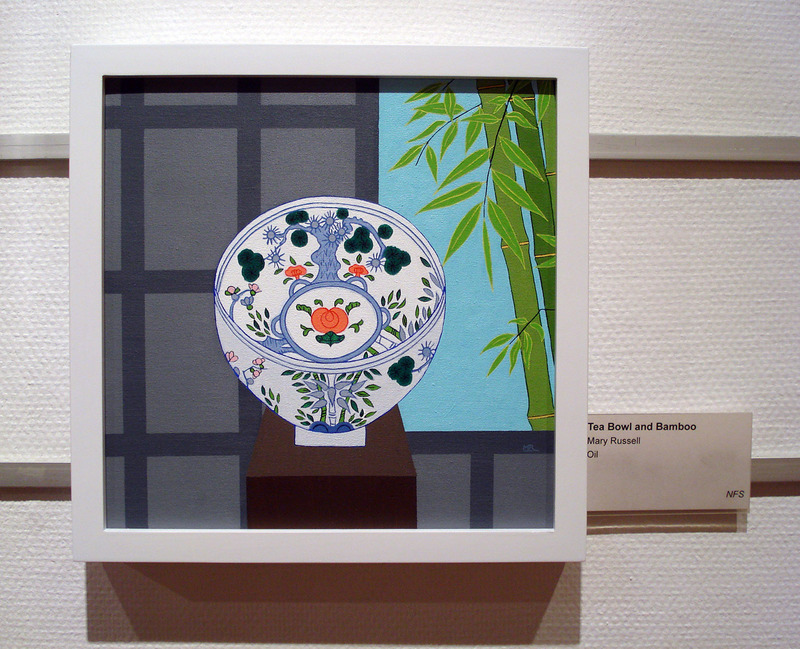 Here is an example – a beautiful painting of an oriental bowl and bamboo by our new Treasurer, Mary Russell. I also noticed a red dot on someone’s work! Well done Marie for making a sale! The exhibition is on until March so there is still time for another look. Well done to everyone who had work accepted. The standard was very high this year and I know that some very talented artists were disappointed. As a past selector and judge I know how difficult it is to choose the final selection but I was surprised this year of how much lovely work was not selected for the show. This morning we dismantled the Autumn exhibition at Worthing Museum. The show had attracted a lot of interest with three new pages of very complimentary comments in the Society’s comments book. Thanks to everyone who helped out. The show was opened by Worthing town crier and councillor Bob Smytherman, dressed in his full regalia, at our preview afternoon on the 5th November. Dramatically ringing his bell and apparently reining in his performance, although you wouldn’t know it, he declared the exhibition open and awarded the Juliet Pannett Rose Bowl to Michelle Watson and the highly commended certificates to Jane Keeley and Audrey Lee. Michelle’s painting had particular significance for Bob and artwork by the runners up also spoke to him on a very personal level. We are very grateful to Bob for giving up his time to judge the show, especially as he had other commitments on that day. There is a new page on this site showing photos of the exhibition. I am also hoping to take some photos of Society members’ artwork in the Worthing Open Exhibition at the Museum, which started on Saturday. I can then add these to this website. I will be asking the Museum for permission in the next few weeks. The Society is well represented in the Worthing Open. Congratulations to all those who were able to get their artwork accepted. Competition was tough and there was definitely an element of pot-luck!